A bunion is a large bony protuberance on the side of the foot by the great toe. 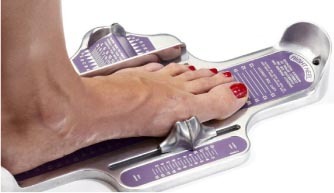 Bunions are usually associated with the great toe moving over and pushing on the second toe. This is a “progressive” problem, in other words they get worse over time. At first this problem may be a minor annoyance, but after a while it can make the wearing of any shoe painful, if not impossible. Initially the pain is on the side of the foot or toe and is initially described as an aching, but over time it often progress to pain inside the great toe joint. This problem may hurt both in and out of shoes. Proper fitting shoes are essential in relieving pressure and pain. The Active Foot Store has a large selection of speciality shoes, that places no pressure on the bunion which will decrease pain. Hammertoes often occur with bunions. They are toes that are contracted or bent in such a way that they sit up higher than they should be. Shoes place pressure on the hammertoes, which over time will result in pain. Sometimes two contracted toes will push on each other and cause pain. Still other times the tips of the toes will press on the ground and this results in pain. Over time the joints may become arthritic and painful. While shoes do not cause hammertoes, proper fitting shoes are essential in relieving pressure and pain. The Active Foot Store has a large selection of special shoes, that places no pressure on the hammertoes and decreases pain. While there are several different medical conditions that can cause these “deformities,” by far the most common cause is an improper walk or gait that results in a muscular imbalance. Shoes are often erroneously blamed for causing these problems. True, shoes can increase pain, but they are not responsible for their formation. As we walk (gait) our feet ideally move in different directions, supination and pronation. Our arches rise up and lock into place (supination), when we are preparing to step off a firm platform, our foot. When we land, our arches unlock and start to lower (pronation), allowing us to absorb shock. Ideally our foot should go through both these motions when walking. Unfortunately not everyone is built perfectly and often our arches unlock excessively or fail to lock properly. This is sometimes referred to as a “flat foot” or “fallen arches” or “collapsed arches.” This flexible, unstable foot results in muscular imbalance that over time will result in joints and toes changing position, resulting in these deformities. Unfortunately only surgery can change the shape of the foot and toes and these problems often progress to the point of requiring surgery. Proper fitting shoes are essential in relieving pressure and pain. The Active Foot Store has a large selection of specialty shoes, that place less pressure on the bunion or hammertoes. 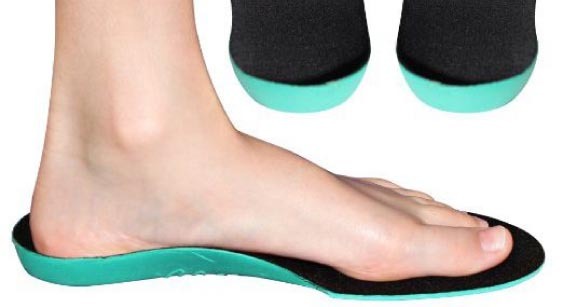 However, since they are the result of an improper walk and muscular imbalance The Active Foot Stores’ custom orthotics can slow down and even stop the progression of these problems, by restoring the foot to its ideal function during walking. They can also provide significant relief of the aching in the joints affected by this conditions. If you would like more information on orthotics please go to About Our Orthotic section on this web page.